The argument over the ethics of blocking adverts has been taken to its illogical extreme. The Verge reports on a new ad blocker that claims to ensure that everyone can consume their favorite content while maintaining their ethics. 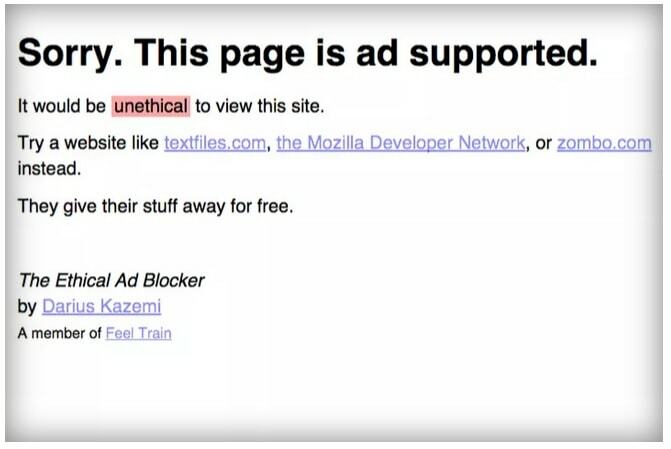 Developed by internet artist Darius Kazemi, the Ethical Ad Blocker Chrome extension won't just block adverts; it blocks any webpage that contains ads and replaces the page with a brief message pointing users to a list of websites with auto-generating content as well as non-profit organizations that give content away for free. "This extension provides a 100% guaranteed ethical ad blocking experience. The conundrum at hand: users don't want to see ads, but content providers can't give away content for free," writes Kazemi on the extension description. He goes on to ironically add "The solution is simple: if a website has ads, the user simply should not be able to see it. This way, the user doesn't experience ads, but they also don't leech free content. Everybody wins." This extension is less intended as a useful tool that as a commentary on the current debate. Kazemi is pointing out to those who call ad-blocking unethical and to those who use ad blockers that there is a worse option: no content at all. That's not a new commentary on the subject (although it is expressed in a unique way). You can find the extension in the Chrome Web Store. I've tried it, and it could use some work. It missed some sites that used a private ad network, and it also returned a false positive on Chrome's own menu pages. I had trouble accessing the page that managed the extensions, and that made it difficult to disable the extension. I feel like he’s missed the point. If advertisers were better citizens users wouldn’t hate the presence of ads so much they feel killing them with fire is the only solution left. Advertisers are just like any other subset of people; some are crappy, some are not. How do you propose we make the not so good ones behave? Government regulations? Which government? Maybe establish a code of ethics? Nah, I don’t think that will help any. The honest people will follow it, but the dishonest will lie and claim to follow it. That defeats the purpose. The tough part is that any proposed solution will cost money. The most annoying ads pay the best, or rather, they will pay the best once fewer networks accept them and the advertisers get desperate. That means that some will be tempted to break the rules.